I have yet to witness a single Preservation Award at the Detroit Autorama that didn’t have a deep emotional story behind it. And this year’s selection, a 1928-1929 era Ford Roadster owned by Scott Pieknik of Clinton Township, is no different. According to a feature article in the Macomb Daily, though, it is stated as a 1929 Ford, but the marquee at Cobo Center stated 1928. Then again, the sign appeared to have Scott’s grandfather’s name, Frank, listed. So I assume this is originally his car but restored by his grandson, Scott, who received it from his father, Jack who is flying in from Arizona for the event. On another note, their last name is spelled wrong on the Cobo Center sign on the wall, but correct on the card on the floor; and correct in the Macomb daily article. Frankly, I do not care; as there is far more to this award. For example, this vehicle involves three generations; and that’s what counts here more than anything. It appears Scott restored a car that was handed down from his dad, Scott, which was handed down from his dad, Frank, who passed away when Scott was but 16. So, that officially makes it originally, Scott’s grandfather’s car. Although I live as well in Clinton Township, I do not know Scott; perhaps met at a car show or two, but I do not recall. Nonetheless, I had a great relation with my own dad; never met my dad’s dad; and lost a parent at a young age, so I can totally relate here. My favorite line in the Macomb Daily article was this: “Scott Pietnik put his effort into restoring it like the grandfather he never got to meet.” Yeah, touched my heart, too. And if it didn’t, then you’re not human but a rock. One thing about flat head engines that early-day hot rodders always liked: To increase the compression ratio, all you had to do was pull the heads and grind or mill off about .010". And no valvetrain adjustments were required, because they stayed in the block. 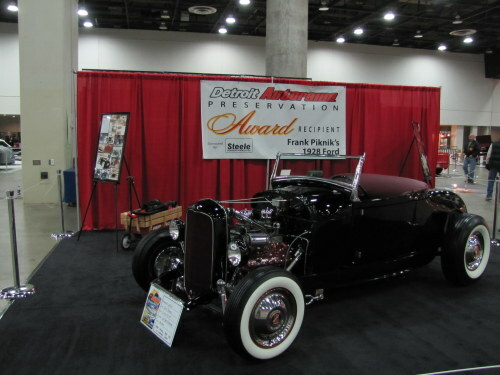 So, congratulations to Scott Pieknik for the winning the 2012 Preservation Award at the 2012 Detroit Autorama. And to make my contribution to the story, I have a video which I shot on Thursday, set-up night. Enjoy and preserve.